Off heat, coat same skillet or wok with cooking spray; set over high heat. When hot, add mushrooms; stir-fry for 5 minutes. 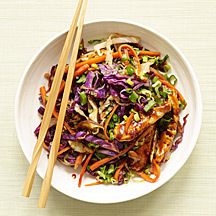 Add slaw mix and reserved sauce mixture; toss to combine. Cook, stirring occasionally, until cabbage wilts, about 4 minutes. Remove from heat and stir in scallions and cilantro; serve mixture on its own or wrapped in large Romaine lettuce leaves. Yields about 1 1/4 cups pork mixture per serving. 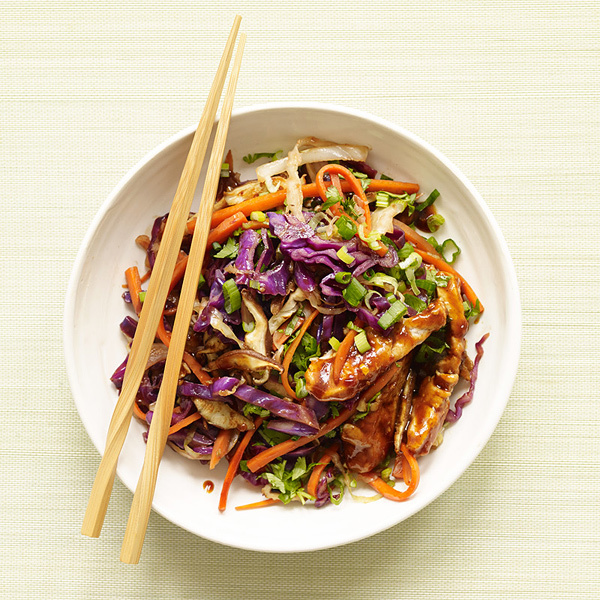 You can substitute 3 cups shredded cabbage and 3 cups shredded carrot for the slaw mix. Don’t be intimidated by the list of ingredients in the sauce for this recipe. You can find them in the Asian section of most major supermarkets. Once you have them, you can use them in many kinds of stir-fry recipes. You can, however, use a bottled sauce if you prefer (could affect recipe’s PointsPlus value).